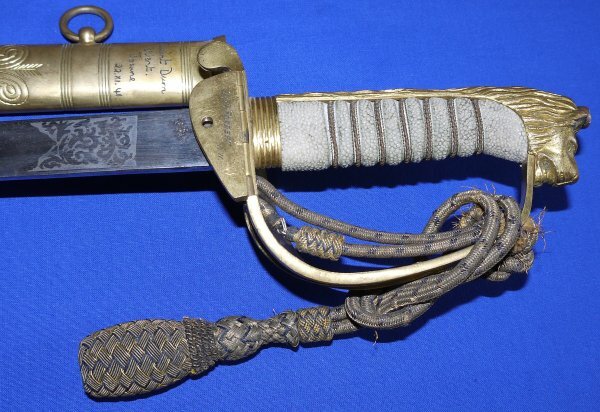 In good condition, WW2 British Royal Navy Commander Donald Alexander Forrest's Sword. Donald Alexander Forrest served throughout World War Two, including as Commander of the destroyer HMS Silverton, and on the battleship HMS Resolution. 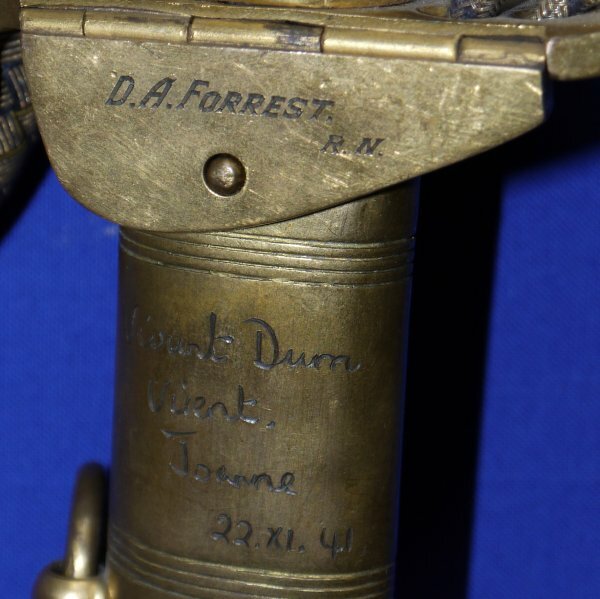 Inscribed "D A Forrest" to the folding guard, and "Vivunt Dum Virent (the family motto of the Forrest family) Joanne 22.XI.41". Commander Forrest had 3 sons, and he was the son of Harry Alexander & Marjorie Forrest, so perhaps Joanne was his wife (great research potential). You can read more about Commander Donald Alexander Forrest here. He died in 2016. The 31 /14 inch blade is in good order, the etching a little rubbed / faded, some minor patina spots, firm in the hilt. The hilt with some gilt remaining. The grip mostly good, a little aged / grubby (not much), the grip wire is all there but perhaps has loosened a little. The original sword knot is aged and with wear but overall good / sound. 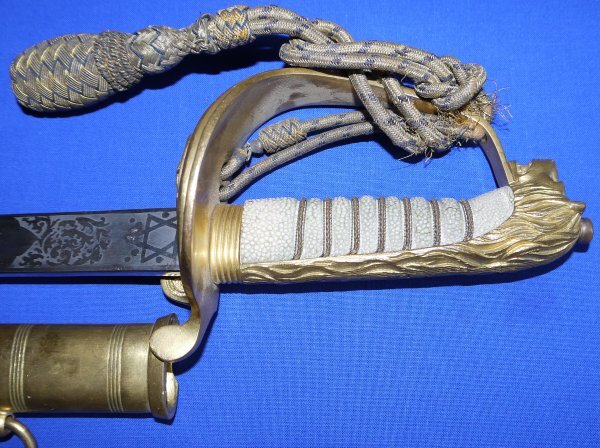 The leather and gilt metal scabbard has a little age but is also good. The folding guard section works well and locates as it should on the top scabbard fitting's retaining pin. The sword sheathes and draws well. 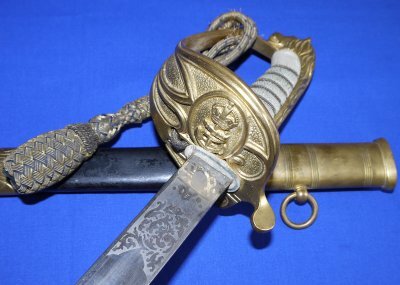 A well above average sword with great provenance and research potential - yours for £700. Please quote item reference AC96. Further / full sized images available upon request. Box 0379-1m (1.894).